Let’s start at the very beginning… In prehistoric times California had a more tropical environment. Sabertooth Tigers, Dire Wolves, Mammoths and many other animals now extinct thrived here for thousands of years before humans came to the area. Prior to Europeans entering the San Fernando Valley in 1769, the ancestors of the Tongva people had inhabited the area surrounding Toluca Lake for 8,000 years. The Tongva village of kah-Ween-gah (Cahuenga), on the banks of the Los Angeles river, enjoyed trade with many other Tongva villages throughout Southern California. The Los Angeles River was then a free flowing habitat for fish and game. Reeds growing along its banks were used to construct huts. 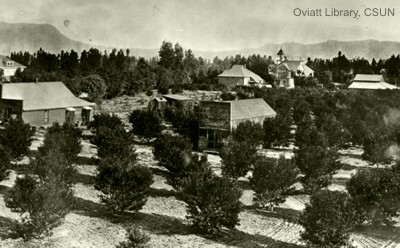 In 1783 the area’s grazing rights for cattle were granted to Mariano de la Luz Verdugo. Spanish missionaries established Mission San Fernando in 1797. The adobe dwelling located just across the river from Toluca Lake was constructed around this time on what was known as the Campo de Cahuenga rancho. You can visit this location today just across the river from Toluca Lake next to the Universal City Metro Station. The Mexican-American War began in 1846, just 25 years after Mexico’s independence from Spain. On January 13, 1847 an agreement was signed at Campo de Cahuenga relinquishing California to the United States and ending conflicts here. The war continued for another year in Texas and Mexico. Pio Pico, who had served as Governor of California under Mexican rule, was a private citizen when he sold some of his personal property consisting of the southern half of the San Fernando Valley to James Lankershim in 1862. In 1887 Charles Forman arrived from Virginia City, Nevada where he had accumulated great wealth. Lankershim sold to Forman the majority of the land that would become Toluca Lake. Forman built a ranch house in the middle of the property northwest of the lake. 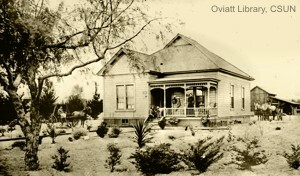 One story claims that Lankershim’s son and son-in-law, James B. Lankershim and Isaac Van Nuys, had named the property Toluca prior to selling it to Forman in 1888. It is said that they selected the name because there had once been an ancient village by that name on the very spot. Skepticism persists about these men providing the name for Toluca because no evidence of such a village has been found. Competition for social recognition and having one’s name in the history books was fierce during this era and it is hard to know which stories to believe. More hard evidence needs to be located showing the name in print. The earliest known mention of the name Toluca pertaining to the Toluca Lake area is found in Forman’s application for a new post office to be named Toluca Post Office. This post office was located in the home of Wilson C. Weddington until he purchased a store in 1894 and moved the post office there. The Weddington Store and Toluca Post Office sat in the middle of one of the many orchards in the area. By 1923 Toluca Lake was blooming with walnut, apple and peach orchards. Charles Forman had died and his ranch was sold as part of his estate. A group of investors purchased the Forman Toluca Ranch with the idea of creating a residential subdivision named Toluca Lake Park. Regardless of whether they believed Forman was the originator of the name Toluca, the name was well established by this time. Though the nearby Southern Pacific Railroad station was known as Lankershim Station, they had named the line the Toluca Flyer for its better known destination. Forman claimed the word Toluca was a Paiute Indian word he selected meaning fertile valley. The Toluca Lake Park venture was abandoned as quickly as it had been created, but then resurrected by a new group formed under the name, The Toluca Lake Company, dropping the word Park from the name. 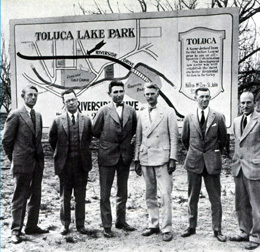 The lake which received its name from the Toluca Ranch in turn had lent its name back to the new community of Toluca Lake. What began as a natural spring fed swampy pond was enhanced into a six acre water feature for the planned neighborhood. It was at the start a park-like setting where residents could wile away many a summer day on the water. The first home built on the lake shore was on Valley Spring Lane (and later became the home of famed aviator, Amelia Earhart). 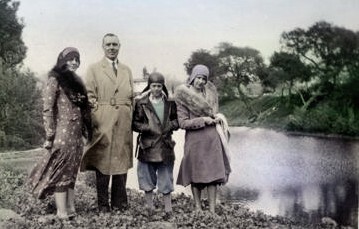 After Warner Brothers opened their lot a block away in 1928, Hollywood’s elite discovered the lake in Toluca Lake. The waters swiftly became surrounded by the most expensive homes in the neighborhood and today the water cannot be viewed by the public, much less enjoyed by the neighbors. Thus, Toluca Lake has remained a wonderfully tranquil community to live in. The lake ranges up to ten feet deep and is regularly stocked with fish. The lake bottom has been entirely sealed with four inches of asphalt to prevent seepage and its water level is now maintained by the Toluca Lake Homeowners Association (a non-profit corporation organized in 1934) via water pumped from the water supply stored in the Los Angeles underground aquifer. The first International House Of Pancakes (IHOP) opened in Toluca Lake in 1958 on the corner where Mo’s now stands. 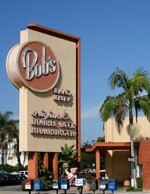 Bob’s Big Boy across the street opened in 1949 and is today the oldest remaining Big Boy restaurant of the chain. The original stalls for car-hop service are still in the parking lot. Other memorable neighborhood establishments live on in the minds of those who have called Toluca Lake home, such as Now Voyager, the Money Tree and the Tick Tock Restaraunt on the corner of Riverside and Talofa. Toluca Terrace can be found in writing as early as 1989. The homeowners in that area chose to create the Toluca Terrace Woods Homeowners Association with a committee, the Toluca Terrace Community Action Committee, to help determine what could be done to improve their neighborhood. Real estate agents began using this name for properties in the area to enhance appeal-by-association with the popular Toluca Lake properties. It sounds better than simply saying, “Toluca Lake adjacent.” Many area names in Los Angeles have been created just for this purpose. A rose by any other name would not smell as sweet. The areas of Toluca Woods, West Toluca Lake and Toluca Terrace are now known as “the Tolucas,” though they were not within the original plan for the Toluca Lake Park development. There is a Toluca, Montana, a Toluca, Illinois, a Toluca, North Carolina… but, there is only one Toluca Lake.